If you want to know, what is leaky brain syndrome, you’re not the only one. Many people are becoming aware of leaky brain syndrome, but they don’t know anything beyond that. So they read article with such title as, What is leaky brain syndrome: Its Prevalence in the U.S. Or, What is leaky brain syndrome: Its Main Symptoms. Or What is leaky brain syndrome: Its Main Cause. And they may read many other articles on this subject. They are afraid leaky brain syndrome has become a hidden epidemic that nobody knows about and experts don’t want to talk about. And because they are unable to find solid answers to their questions, they are becoming afraid. If you are one of these people who has been asking, what is leaky brain syndrome, without receiving the answers you need, you’ve come to the right place. We’re here not only to answer the question, what is leaky brain syndrome, but also to give you the information you need to heal this condition. So…let’s start with your first question: What is leaky brain syndrome? Leaky brain syndrome is a condition in which the blood-brain barrier has been damaged, allowing toxins, pathogens, and other dangerous substances to “leak” into the brain’s sensitive environment. The blood-brain barrier is composed of brain capillary endothelial cells that are linked together by what’s called “tight junctions,” similar to the tight junctions lining your intestines. The tight junctions in the blood-brain barrier are semi-permeable, meaning they allow helpful substances through, such as amino acids and nutrients while blocking dangerous substances. It is a delicate balancing act, but one a healthy blood-brain barrier handles well. What is Leaky Brain Syndrome’s Effect on the Brain? But when the blood-brain barrier is compromised, all manner of dangerous substances freely make their way through the barrier and right into the brain. Once there, they activate the microglia cells causing inflammation, which leads to many mental and physical problems. Why is inflammation such a big deal? Well, inflammation usually isn’t a big deal. Acute inflammation is the body’s first response to a foreign invader, such as a pathogen or injury. It occurs to trap the invaders so they can be removed from the body and so healing can take place. After the healing has been sufficiently accomplished, the inflammation recedes. By contrast, chronic inflammation does not go away. Either the immune response is repeatedly triggered, or it cannot get rid of the foreign invader. In either case, the continual inflammation damages tissue, causing more inflammation and more of an immune response. This leads to health problems, the nature of which depends upon the tissues affected. What does any of this have to do with the brain? Well…because the brain is the control center of the body, neither acute nor chronic inflammation should ever occur in the brain. 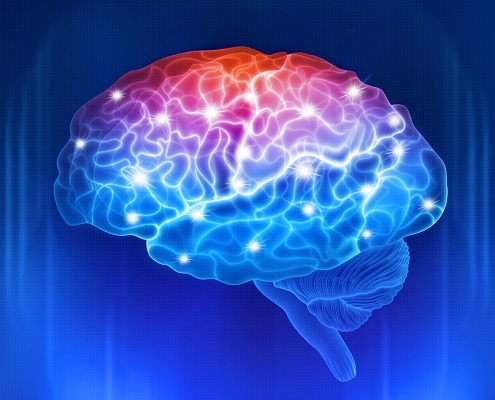 The blood-brain barrier is supposed to protect it from any dangerous substances. But when it becomes leaky, allowing these dangerous substances to enter, chronic neurological inflammation is the result. This causes a variety of disturbing and even dangerous mental and physical health problems. What is Leaky Brain Syndrome’s Effect on Mood? 40 million U.S. adults suffer from one or more anxiety disorders every year. That is 18.1% of the U.S. population. More than 16 million adults suffer from a major depressive disorder (MDD) in a given year. That’s 6.7% of the adult population. MDD is the leading cause of disability for those aged 15 to 44.3 in the U.S.
Depression and anxiety can be two of the most crippling mental illnesses, yet there has never been a treatment that offers a 100% cure or relief to everyone who suffers from them. Interestingly, leaky brain syndrome’s effect on mood disorders via neurological inflammation is pretty well established. A study published in Cardiovascular Psychiatry and Neurology Journal noted a link between leaky brain syndrome and depression. Another study published in the 2017 edition of Neurology Journal showed those with high levels of neurological inflammation showed correspondingly higher levels of depression and anxiety. What is Leaky Brain Syndrome’s Effect on the Mind? As you might expect, leaky brain syndrome also has a considerable effect on the mind. According to a study by the University of Cambridge, there is little doubt neurological inflammation plays a large role in cognitive disorders. What are cognitive disorders? A cognitive disorder can be as “minor” as occasional forgetfulness or brain fog and as major as Alzheimer’s and Parkinson’s disease. Dementia is also a cognitive disorder. So, the memory problems many people consider as just normal age-related issues may actually be caused by leaky brain syndrome and neurological inflammation. What is Leaky Brain Syndrome’s Effect on Weight? Studies show leaky brain syndrome can also cause a slowed metabolism and weight gain. The reasons how and why this can happen is not that difficult to understand. You see, the brain has always been in charge of the metabolism. But when leaky brain syndrome causes neurological inflammation, these signals stop working. The hypothalamus either no longer receives these signals or it cannot read them correctly. The result is that it gives you more fat. Your brain and hormones now work to hold on to extra weight, and it doesn’t matter how little you eat or how hard you workout at the gym. If you do lose weight by cutting calories, you’ll gain all the weight back as soon as you go off that diet. In other words, cutting-edge research proves neurological inflammation raises setpoint weight, making it nearly impossible to lose those extra pounds until you heal the inflammation. A 2016 study in The Journal of Nutritional Biochemistry boldly declares neurological inflammation to be a likely cause of hormonal dysregulation leading to obesity. That’s not the only study linking neurological inflammation to an elevated setpoint weight and consequent weight gain. What is Leaky Brain Syndrome’s Effect on Physical Health? Studies even show leaky brain syndrome affects physical health. Specifically, the neurological inflammation it causes leads to high blood pressure and insulin resistance that increases the risk for disease. But leaky brain syndrome does not just cause symptoms of metabolic syndrome. A review published in the Medical Hypotheses Journal found that leaky brain syndrome may contribute to chronic fatigue syndrome, a condition that causes extreme tiredness. What is Leaky Brain Syndrome’s Main Cause? Many things contribute to leaky brain syndrome, but probably the main cause is the Standard American Diet. Regularly eating refined sugars, starchy carbs, and heavily processed foods harm the integrity of the blood-brain barrier, causing it to become “leaky.” Sugars and refined carbs also cause systemic inflammation, which itself can cause the tight junctions to become more permeable, allowing dangerous substances into the brain’s fragile environment. And switching to whole grain bread and other products rather than refined carbs doesn’t offer any significant protection. Studies show gluten, a protein present in wheat, can make the tight junctions more permeable. What are Other Causes of Leaky Brain Syndrome? Stress: Research indicates acute stress activates inflammatory cells in the body, leading to permeability of the blood-brain barrier. Environmental Toxins: Constant exposure to environmental toxins promotes leaky brain syndrome. These toxins are so common you probably don’t even know you’re being exposed. These toxins are in your household cleaning supplies. They’re in the pesticides and herbicides sprayed on the foods you eat. They are in the air you breathe. You cannot totally escape environmental toxins. The best you can do is try to reduce your exposure to them. Chronically Low Levels of Brain-Boosting Nutrients: Most people in the U.S. are deficient in these 4 critical nutrients that protect the blood-brain barrier and help prevent neurological inflammation. Folate: This nutrient is essential for proper cognitive function. Unfortunately, most people are deficient in folate either because they cannot absorb it or they do not get enough through their diets. CoQ10: This nutrient sparks energy production in every cell of your body, particularly your heart and your brain. Not all CoQ10 supplements are created equal, however. You need to make sure you’re selecting a product that is fully bioavailable with a 24-hour timed release so that it gives you around-the-clock protection. L-Carnitine: This nutrient sets fire to the energy CoQ10 brings into your cells. For that reason, you should always take CoQ10 and L-Carnitine together in correct dosages. What are the Best Ways to Cure Leaky Brain Syndrome? Eat High-Quality Foods: The best way to cure leaky brain syndrome is through proper nutrition. Reduce your consumption of heavily processed foods, refined sugars, and starchy carbs. Add more whole foods to your diet. Prepare more of your meals at home instead of going to restaurants. The SANE Diet provides the nutrition you need to support a strong blood-brain barrier and to cure leaky brain syndrome. The 4 SANE food groups are non-starchy vegetables, nutrient-dense proteins, whole-food fats, and low-fructose fruits. Choose foods as close to their natural states as possible, making sure to consume at least 10 servings per day of non-starchy vegetables. SANE foods fill you up quickly, keep you full for hours, and stabilize blood sugar levels. This protects your blood-brain barrier. Reduce Stress: Lowering your stress levels needs to be a priority. There are many ways to do this. Meditate. Practice Yoga or TaiChi. Take a walk in the park. Go to the movies with friends. Do something nice for a stranger without expecting anything in return (not even a “thank you.”) You’ll be surprised how good this will make you feel. All of these — and anything else you enjoy doing — will lower your stress levels. Reduce Exposure to Toxins: Switch to natural household cleaners, air fresheners, and dryer sheets. Vacuum your floors daily using a HEPA filter in your vacuum. Eat organic foods. Avoid plastic water bottles. Remove your shoes when entering your home to avoid carrying toxins in from outside. Take SANE Vitaae: This new anti-aging, brain-boosting nutraceutical is the first clinically proven formulation created to heal neurological inflammation. It contains all 4 of the brain-boosting super nutrients — folate, citicoline, CoQ10, and L-carnitine — in the correct combinations and dosages you need to heal any neurological inflammation that has occurred. https://sanesolution.com/wp-content/uploads/2018/09/what-is-leaky-brain-syndrome.jpg 667 1000 7728pwpadmin https://pages.sanesolution.com/wp-content/uploads/2018/01/sanepages-logo.png 7728pwpadmin2018-09-03 01:00:092018-09-26 16:19:31What is Leaky Brain Syndrome and Why Does it Matter? ADHD: Is What You Eat Slowing You Down? Attention Deficit Hyperactivity Disorder (ADHD ) is a mental health condition that includes a combination of continual problems involving the inability to pay attention, the tendency toward impulsive behaviors, and the exhibiting of extreme restlessness of mind or movement (hyperactivity). ADHD affects an estimated 3% to 5% of children and adults in the United States. According to the Centers for Disease Control, ADHD is among the most common of neurobehavioral disorders of childhood. It is usually first diagnosed in childhood, and more than half of these children carry this condition into adulthood. Those who seek treatment for ADHD are often prescribed a combination of medications and behavioral therapy. The doctor may even recommend an “ADHD diet,” but if such recommendation is made, it will be mentioned almost as an afterthought. Medical doctors rarely mention the importance of diet over drugs, especially when it comes to ADHD. But do you know that what you eat — the quality of your diet — can affect symptoms of ADHD, that certain foods can improve your symptoms? Did you know that these foods can slow your brain down, allowing you to make better decisions? It’s true. In fact, studies show certain foods can be as powerful as medications in calming and slowing down the racing minds and bodies of those with ADHD. But before revealing these ADHD superfoods — and why they work so well — we should discuss the unique characteristics of ADHD. Though everyone loses focus or is hyperactive at times, those with ADHD exhibit an ongoing pattern of inattention and/or hyperactivity severe enough to interfere with everyday life and development. Those who suffer from ADHD may exhibit just a few symptoms of the disorder, and these symptoms may range from mild to severe. Here is a brief overview of the general meaning of the three aspects of ADHD: inattention, hyperactivity, and impulsivity. Inattention: The person has difficulty paying attention. Those with inattentive ADHD are often misdiagnosed as having a learning disorder. They are the ones who in school quietly stare out the window while not completing their schoolwork. They are the ones often accused of daydreaming too much. These behaviors are not caused by a lack of understanding of the subject; rather, the person lacks the ability to settle their mind on a single topic long enough to successfully complete a task. Hyperactivity: This person is always in motion, never seeming to slow down, and constantly talking or fidgeting. Often has difficulty completing tasks. Impulsivity: This person often takes risks without thinking about the consequences. They also make impulsive decisions, and they typically have an inability to delay gratification. Here are examples of some of the most common behaviors for inattention and hyperactivity/impulsivity. The exact cause of ADHD is not known. However, research shows that a number of factors may contribute to this condition. Here are a few of them. There is no known cure for ADHD. The symptoms of this condition have traditionally been managed with a combination of medications and behavioral therapy. Here are some of these treatments. The most common type of medications prescribed for ADHD is stimulants. Though it may seem strange to prescribe stimulants for a hyperactivity disorder, these medications work because they increase levels of the brain chemicals dopamine and norepinephrine. Both of these brain chemicals are essential for increasing attention. The most common stimulant medications prescribed for ADHD are Ritalin and amphetamines, such as Adderall. These medications are quick-acting and have been proven to increase focus and concentration. They are also well-tolerated by most patients. But that doesn’t mean they don’t cause any side effects. In addition to stimulant medication, doctors sometimes prescribe antidepressants to treat symptoms of ADHD. Antidepressants that affect the brain chemicals dopamine and norepinephrine have been found to be especially effective. Behavioral therapy is a type of therapy designed to help change behavior. It assumes all behavior is learned, and that negative behaviors can be replaced by learning new, positive behaviors. There are specific behavior therapy techniques that are especially effective in treating ADHD. Positive reinforcement: Providing rewards or praise in exchange for desired behavior. Example: Child finishes dinner and is allowed to take the dog for a walk. Time-out: Removing access to desired activity because of misbehavior. Example: Child screams at Mom and, as a result, must sit in the corner of the room for 10 minutes. Response Cost: Child loses privileges because of undesirable behavior. Example: Child loses computer privileges for not completing chores. There are also different forms of behavioral therapy, such as cognitive therapy and mindfulness therapy, which are also useful treatments for ADHD. The goal of cognitive behavior therapy is to recognize your beliefs, thoughts, and attitudes so that you can get a clear idea of any damaging, false beliefs. Only when you have a clear idea of any false beliefs can you change them. Cognitive behavior therapy is a combination of cognitive therapy and behavior therapy. Mindfulness therapy is similar to cognitive behavior therapy in that it teaches you to notice your own thoughts as just thoughts, without identifying with them. It’s being aware of what’s happening in the present moment without judgment. Though these two types of therapies – medications and behavioral therapy — do work, there is a problem. Up to 17.5% of children with ADHD surveyed by the Centers for Disease Control were not receiving any treatments for their condition. Could this be because medications and psychological therapy are too expensive? Is there a better, cheaper way to treat ADHD? Treating ADHD with diet is a viable option. In fact, studies show certain foods can optimize brain function, improving focus and decreasing hyperactivity. By contrast, deficiencies of certain nutrients can worsen symptoms of ADHD. Here are a few nutrients that can worsen ADHD symptoms if levels are too low. Zinc helps the digestive system function properly, supports the immune system, and helps maintain a proper metabolism. The mineral zinc is also a powerful nutrient for the brain. It regulates dopamine in the brain, which can make Ritalin and similar ADHD drugs work better by making the brain more responsive to dopamine. Many studies show a correspondence between low levels of zinc and inattention. Foods that contain high levels of zinc include meat, seeds, nuts, shellfish, and eggs. Iron is responsible for transporting oxygen throughout the body, helping convert blood sugar to energy, and supporting the immune system. Iron is also a key mineral for making dopamine and other neurotransmitters. Indeed, low iron levels have been associated with cognitive problems and extreme ADHD symptoms. Foods that contain high levels of iron include liver, turkey, spinach, and shellfish. Magnesium is responsible for bone formation, calcium absorption, and heart health. Magnesium is another mineral necessary for making neurotransmitters in the brain. Magnesium has been shown to soothe brain activity, which can moderate hyperactivity. Foods that contain high levels of magnesium include pumpkin seeds, spinach, cashews, sunflower seeds, and avocados. Vitamin B-6 is responsible for healthy cognitive function, supporting eye health, and promoting healthy skin. It is also an important vitamin for those who suffer from ADHD. Studies show a deficiency of vitamin B-6 decreases levels of dopamine in the brain, which promotes inattention. Providing adequate amounts of vitamin B-6 increases focus and attention. Foods that contain high levels of vitamin B-6 include salmon, chicken, beef, bell peppers, and asparagus. Omega-3s have been found to be crucial in proper brain cell function. Several studies have shown omega-3s to be effective at reducing symptoms of ADHD. One such study in Sweden found that daily doses of omega-3 fatty acids reduced ADHD symptoms by 50%. Foods that contain high levels of omega-3 fatty acids include salmon, tuna, spinach, grass-fed beef, and chia seeds. Studies show these foods can improve symptoms of ADHD. Increasing your intake of high-quality protein is one of the best ways to improve your symptoms of ADHD. Increasing your intake of protein helps prevent blood sugar spikes. This is because it takes over three hours for your body to digest and assimilate protein. A slower digestion process means slower absorption into the bloodstream, which prevents sharp rises in blood sugar levels. This helps reduce hyperactivity. Your body also uses protein to make neurotransmitters, which helps brain cells communicate with each other. If you want to make sure you’re getting enough protein, try to eat a serving of nutrient-dense protein at every meal. Egg whites, grass-fed beef, and nonfat Greek yogurt are great sources of protein. You can also add SANE Clean Whey Protein Powder into a green smoothie, or eat SANE Vanilla Cashew Protein/Meal Bars. Like protein, fiber slows the absorption of foods into the bloodstream. But unlike protein, your body cannot digest fiber. It just hangs around in your gastrointestinal tract until it’s ready to be eliminated. But in the meantime, it keeps all the other foods you’ve eaten with the fiber from being quickly digested and absorbed. This prevents blood sugar surges that often cause hyperactivity. Want to be sure you’re getting enough fiber? Eat at least 10 servings of non-starchy vegetables per day. Either fill half your plate with non-starchy vegetables at every meal or blend them into green smoothies. Kale, broccoli, bell peppers, asparagus, carrots, and spinach are great choices to add to your dinner menu. Choose non-starchy vegetables rather than grains, even whole grains. This is because starchy carbs, even the whole-grain variety, cause surges in blood sugar levels. This increases the risk of hyperactivity. There are also a few food groups you should try to avoid as much as possible. Sugary Foods: Refined sugar causes blood sugar surges that contribute to mental and physical hyperactivity. Many studies have shown a correlation between excess sugar consumption and inattention. Another study showed the more sugar hyperactive children consumed, the more restless and destructive they became. Processed Foods: Many studies show certain ingredients in processed foods — such as food coloring and preservatives — may worsen ADHD symptoms in some children. To avoid this problem, avoid heavily processed foods as much as possible. Shop the perimeter of the grocery store where meats and produce are displayed. Stay away from the center aisles where processed foods, laden with artificial colorings and preservatives, are sold. Grains: Studies suggest wheat, corn, and other grains cause inattention in children. This worsens symptoms of ADHD. Nutritionists attribute this effect to possible food allergies. One of the best ways to treat the symptoms of ADHD is to eat a SANE balanced meal. The 4 SANE food groups are non-starchy vegetables, nutrient-dense proteins, whole-food fats, and low-fructose fruits. At every meal, fill half your plate with non-starchy vegetables, a fourth of your plate with nutrient-dense protein, and the remainder of your plate with whole-food fats. A SANE balanced meal provides the nutrition your body needs while keeping blood glucose levels stable. Such a balanced meal also addresses any nutritional deficiencies that contribute to the symptoms of ADHD. Going SANE is a tasty way to help treat the symptoms of ADHD. Try it and see! https://sanesolution.com/wp-content/uploads/2018/08/ADHD.jpg 667 1000 7728pwpadmin https://pages.sanesolution.com/wp-content/uploads/2018/01/sanepages-logo.png 7728pwpadmin2018-07-29 12:06:362018-08-31 12:10:08ADHD: Is What You Eat Slowing You Down? When you hear the term, “high cholesterol,” you probably think about heart disease first, and too much saturated fat in the diet, second. But what if neither of these things is true? What if the real cause of heart disease is quite different, and what if your doctor doesn’t know about it? To be sure, hearing anything different from the above causes of heart disease will send your head spinning. But which would you rather do: continue believing inSANE lies about high cholesterol, change your diet to reduce your cholesterol, and find out later these changes actually caused your heart attack? Or…would you rather learn the truth and bring some SANEity to your life about diet and high cholesterol? It’s up to you, of course. But the truth will set you free from old diet myths that do nothing but cause misery and illness. High Cholesterol, Diet, and You? If you have high cholesterol, you’re not alone. One in three American adults has cholesterol levels considered too high, according to the Centers for Disease Control. Since high cholesterol is a major risk factor for heart disease, says conventional wisdom, the American Heart Association recommends that you should have your cholesterol and other risk factors checked every four to six years – starting at age 20. Is this necessary, though? Is cholesterol really the boogeyman of your cardiovascular system? Research in the past few years, as well as a surprising number of medical doctors (including cardiologists), say NO. Which brings us to the first thing your doctor doesn’t know about cholesterol, or maybe he or she has just forgotten it in all the hooey about high cholesterol. Cholesterol has become so vilified that it might surprise you to learn that this substance is not only good for you, but you also need it to live. Every cell in your body is made from cholesterol. This waxy substance helps your metabolism work properly, as it is essential for the production of Vitamin D and bile acids that help your body digest fat and absorb vital nutrients. Cholesterol is also necessary for the production of steroid hormones, which include estrogen, testosterone, and progesterone. Cholesterol is so important to your survival that it doesn’t rely on you to get it from your diet. Your liver takes care of it for you, producing around 75 percent of your body’s cholesterol. The fact that your liver produces such a substantial amount of cholesterol is a huge sign that cholesterol is GOOD for you. But how does your diet play into all of this? That leads us to the second thing about cholesterol and diet your doctor doesn’t know. Cholesterol in the Diet does not Cause High Cholesterol. Cholesterol in the diet comes from meat, poultry, and full-fat dairy products. For the past 20 years, experts have cautioned Americans to consume less than 300 milligrams of carbohydrates a day. If you want to reduce your chances of heart disease, then, you really have to cut out eggs and all saturated fats. After all, just one egg yolk has 200 milligrams of this artery-clogging gook! This advice stems from the belief that there is a link between cholesterol in your diet and that in your bloodstream. This belief started in the late 50s, with the work of Ancel Keys. Ancel Keys, an American physiologist, had an epiphany one day. He wondered why American business executives – surely, he reasoned, some of the best-fed people in the world – had high rates of heart disease. At the same time, Keys noticed the reverse was true in post-war Europe. With food supplies sharply reduced, European countries saw a decrease in heart disease. Keys theorized that cholesterol played a role in cardiovascular disease (CVD), and presented his hypothesis at the World Health Organization in Geneva. From 1958 to 1964, Keys and colleagues visited seven countries and examined their dietary habits against their cholesterol levels and rates of cardiovascular disease. Based on his analysis, Keys concluded that high cholesterol was a risk factor for CVD and that a diet high in saturated fat caused high cholesterol. There are some problems with Keys’ research, however. The biggest problem is that Keys only selected 7 countries out of 22, and the ones he left out – such as France and Germany – were ones he knew had low rates of heart disease, despite diets rich in saturated fats. Nevertheless, Keys’ research became the truth about eating a high cholesterol diet and heart disease. The fact that the famous Framington Heart Study, conducted around the same time, found no connection between cholesterol consumption and CVD didn’t matter. The only thing that mattered is that the cholesterol industry could make big money on this new medical condition. Pharmaceutical companies started developing drugs to lower cholesterol and food companies started producing and marketing low-cholesterol foods. In 2015, the U.S. Dietary Guidelines Advisory Committee ruled that, essentially, consuming cholesterol has no effect on your serum (blood) cholesterol level. This committee of experts meets every five years and provides the scientific basis for both medical- and government-established nutritional guidelines. In their report, the experts said that there would be no more limitations on cholesterol consumption for Americans because there is no evidence that consumption of cholesterol affects serum cholesterol. Being told, after all these years, that there is NO link between dietary cholesterol and serum cholesterol may shock you and your doctor. But it doesn’t surprise Dr. Stephen Sinatra, a board-certified cardiologist and co-author of the bestseller, The Great Cholesterol Myth. Dr. Sinatra, who had been a practicing cardiologist for over 40 years, has long known there was no link between dietary cholesterol and serum cholesterol, or between cholesterol and heart disease, for that matter. Dr. Sinatra says that cholesterol plays only a “supporting role” in heart disease. He hopes the next time the Advisory Committee meets in 2020, they make the same decision about saturated fat and cholesterol. This brings us to the third thing doctors don’t know about diet and cholesterol. Thanks to Keys and other factors – including monetary interests – dietary fat was demonized by experts and the media. Eating fat was believed to raise serum cholesterol, which increased the risk of heart disease. The story behind the demonizing of dietary fat is outrageous! The media and sugar industry literally duped American into believing a lie for decades! Due to increased rates of heart disease in the 1950s and 1960s, researchers were searching for something to blame it on. There were two theories for the rise in heart disease – increased consumptions of sugar and increased consumption of saturated fat. Several studies had already shown sugar to be a contributing cause of heart disease, and that was not okay for the leaders of the sugar industry. The Sugar Research Foundation secretly funded a scientific review of the research that downplayed sugar’s role in heart disease. Of course, this review, which was published in the New England Journal of Medicine, appeared to be impartial. The three Harvard researchers who wrote it were certainly impartial. But what nobody knew at the time is that the Sugar Research Foundation had selected the studies favorable to their industry, ones that also were critical of saturated fat consumption. That review set off a chain reaction of non-fat, low-fat everything, a dietary recommendation that has hurt more than helped us. In fact, going low-fat caused the obesity and type 2 diabetes epidemic and contributed to many illnesses. Our bodies need dietary fat to function properly. The truth is that there is not one shred of scientific evidence that a saturated fat causes heart disease. In fact, according to Dr. Sinatra, eating a moderate amount of saturated fat is heart healthy, and it is also good for overall health. However, the quality of the fat you eat can cause abnormal cholesterol levels. Eating huge quantities of saturated fat, trans fats or hydrogenated fats do have a negative effect on your cholesterol. But eating monounsaturated fats and omega-3 fats lowers your cholesterol and improves its quality. If high cholesterol is not the enemy of the heart, what is? The answer may surprise you – and your doctor. What Causes High Cholesterol Levels Then? There are many reasons for high cholesterol. As previously mentioned, eating bad fats can cause abnormal cholesterol levels, as can excess sugar and carbohydrate consumption. Some people are also genetically predisposed to having high cholesterol levels. Inflammation is the real cause of cardiovascular disease, as it is for so many other diseases. Inflammation itself is quite natural. It is your body’s way of fighting threats to the system, such as bacteria, environmental toxins, sugar, wounds, etc. It’s only harmful if it becomes chronic. Cholesterol does create arterial plaque, and it does build up and clog the arteries, but it’s not because the cholesterol level is too high. It is because small, dense LDL cholesterol particles have become oxidized. Oxidation, or free-radical stress, is one of the major triggers for inflammation. According to Mark Hyman, MD, Director of Cleveland Clinic’s Center for Functional Medicine, that’s the real danger of cholesterol. When these small particles are oxidized, it triggers the build-up of plaque or cholesterol deposits in your arteries. Though doctors test your HDL (good) and LDL (bad) cholesterol levels and use these numbers to predict your risk of heart disease, it’s much more complicated than that. Research has shown that there are subtypes of both HDL and LDL based on particle size, and they have different effects and come with different risks. For instance, small, dense LDL particles are more of a predictor of heart disease than large, fluffy particles. Why? Because they are vulnerable to oxidative damage and more likely to become jammed into arterial walls, creating inflammation. Large, fluffy particles, on the other hand, bounce off the arteries. They’re harmless, even if you have high cholesterol. There are two clinical tests that measure the subtypes of HDL and LDL and analyze the particles within them: Vertical Auto Profile (VAP) and the Lipoprotein Particle Profile (LPP). What makes those small LDL particles? According to Dr. Hyman, the culprit is sugar and refined-carbohydrate consumption. Not only does consuming sugar and carbs (white food) create these dangerous particles, but it also lowers good cholesterol and raises triglyceride levels. Consuming high fructose corn syrup, which is an ingredient in most sweetened beverages and processed foods, is particularly harmful in this regard. Green, leafy vegetables, such as spinach and kale. Fruits, such as oranges, blueberries, and strawberries. So, if you want to reduce your risk of heart disease, you shouldn’t worry as much about high cholesterol as you do about what is in your diet. Are you Ready for Some SANEity? What you eat should be nutritious and anti-inflammatory, such as non-starchy vegetables and nutrient-dense protein. The SANE Solution does just that, focusing on a balanced diet that fills you up fast and keeps you full longer. There is no hunger and no depriving yourself of tasty meals. The goal is to be so full of SANEly good foods, that you can’t even think about reaching for that candy bar or other inSANE food. Non-starchy vegetables: 10+ servings a day. Non-starchy vegetables contain high amounts of antioxidants, which prevent free-radical formation and inflammation. Nutrient-dense protein: 30-50 grams at each meal. Choices include egg whites, plain Greek yogurt, salmon, and chicken. Salmon and other fatty fish have high levels of omega-3 fatty acids, making them an anti-inflammatory treat. Low-fructose fruits: 0-3 servings per day. Good choices include acai berry, blueberries, cherries, and strawberries. Eating SANEly will also lower your setpoint weight, which will result in long-term weight loss and maintenance. This will further reduce your risk for heart disease. So what are you waiting for? Click here to get started. It’s FREE! There is much more to the SANE lifestyle. Getting 7-8 hours of sleep a night, reducing stress, staying hydrated, and performing eccentric exercises are other important factors in lowering your setpoint. 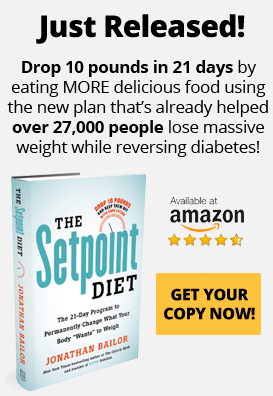 Ready to finally break free from the yo-yo dieting rollercoaster that can lead to diabesity? By balancing your hormones and lowering your body’s set-point weight, SANE is the solution you’ve been dreaming of. Want to know the exact foods and serving sizes scientifically proven by over 1,300 peer-reviewed research studies to boost metabolism, burn fat and enjoy virtually effortless weight loss like a naturally thin person?